Travel Companies: Travel companies are eager to minimize their losses and will often offer fabulous last minute deals. If your travel plans are flexible, you may have several last-minute deals from which to choose. IFlyBusiness Agents: Booking your flight online does not always equal a great amount of savings. However, the services offered by an IFlyBUsiness agent can be advantageous because they will advise you with pertinent information and offer unadvertised fares on last minute bookings saving you thousands. 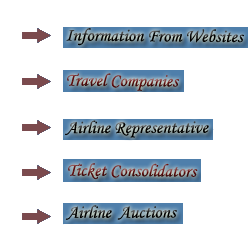 Ticket Consolidators: Ticket consolidators purchase flights on a large scale and then sell them for profit. Often, as the date of departure draws near, unsold tickets will be offered for sale at considerably lower prices as ticket consolidators would rather sell at a loss, rather than lose the entire cost. When it comes to saving money by booking last-minute flights, you should be prepared to act fast. Inexpensive, last-minute flights and travel packages are often snatched up quickly by cost-conscious travelers. Consult with an agent for awesome discounted deals. Book your last-minute flights through our company as we are a reputable online travel agency with over eleven years in Business. We have A+ ratings with the BETTER BUSINESS BUREAU and help our clients travel on the best dicounted Business and First Class flights.